When I joined the Slow Food USA delegation trip to Terra Madre in Turin, Italy a few years ago, I added on a few bonus days in Rome. I couldn’t get enough out of the city, racing from one farmers market to the next, going on dizzying adventures to track down obscure shops and restaurants (not always successfully), walking miles in expansive city gardens and just soaking in the stunning ancient city’s incredible vibrant energy. And, I opted to crazily bike everywhere possible, braving the city’s notoriously chaotic traffic-clogged boulevards and narrow roads. By the time Shabbat arrived, I was exhausted. This variety of hot peppers that I bought at the farmers market have a range of levels of heat. One is so intense that only a few flakes from it are needed for an entire dish. I was invited to a local family’s home for dinner and was instructed to meet them at a synagogue. It was a beautiful building. The creamy yellow sanctuary walls were adorned with hand-painted murals and designs. I somehow missed the family and their guests departure but was directed by the guard to their home nearby. I found myself at the entrance to an imposing, grand, home with many names listed at the door. Inside, the building’s massively-wide stone staircase was filled in the middle with an ornate elevator cage. Each floor was a different business-a small hotel, offices, beauty salon. Finally, at the seventh floor was the family’s home. The dark, modest foyer opened into a grand, elegant living room. The heavy wooden furniture was covered in silks and velvets and heavy drapes covered the historic building’s enormous windows. Off of the sprawling living room was a large terra-cotta tiled patio that still had a sukkah as the holiday had only recently ended (and this being Italy, of course it was also beautiful, elegantly strung with lights and dried local produce). There were about a dozen Israeli guests, plus me and the family. The Israeli guests were of every age and background ranging from a family on vacation to a newlywed couple, secular to religious. We sat at a massive wooden dining room table laid out with white china, crystal glasses, sterling silver and freshly ironed napkins. There was staff to serve us and one brought me a special small plate of pieces of eggplant immersed in a spicy tomato sauce (i.e. like matbucha) after I passed on the first course’s meat-dishes. The family’s mother came over and leaned in to me as she warned me, “this is harif. Really harif.” (harif means spicy). It was delicious and harif. But, not overpowering. I tasted the heat but it was muted by a delicate balance between the mild eggplant and acidic tomatoes. The eggplant was soft, delicate and chewy. After the main course at this elegant meal, there was an awkward but memorable moment when one guest decided to use his still white cloth napkin to wipe his entire plate–filled with tomato sauce– clean, if as to prepare for another course. He was left with an oily, bright orangey-red napkin and a white plate. 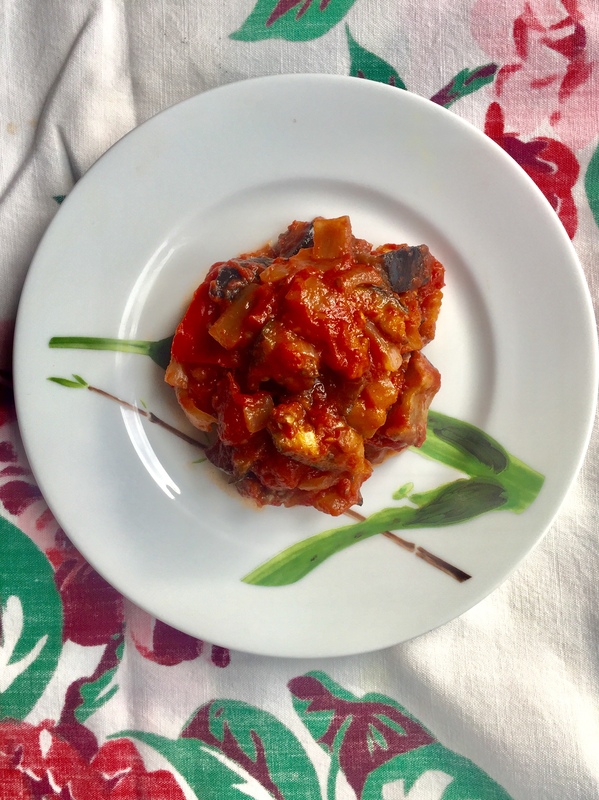 Below is a humble attempt to recreate the delicious harif (spicy) eggplant dish, inspired by a recipe I found on Tori Avery’s site. 1. Pre-heat oven to 350 degrees. Line a baking sheet with parchment paper. 2. Trim the ends of the eggplant and peel strips of it off (creating stripes). Quarter and then cut the eggplant in 1/2-1 inch slices. Place on the baking sheet along with the whole red pepper. Drizzle with olive oil. 3. Bake for approximately 20-25 minutes until eggplant and red pepper are lightly browned, not charred. 4. While they are baking, prepare the other ingredients. Add about a tablespoon of olive oil to a pot over a low-medium flame and add chopped onion. Cook for about five minutes, until translucent. Add the minced garlic, and tomatoes. Mix well. Add the jalapeno pepper. I’d err on the side of less initially. You can always add more heat to the dish if it’s not spicy enough. The seeds are the hottest part of the jalapeno. If you prefer not to use jalapeno, use schug or harissa (try a teaspoon or so at a time and gauge the heat). 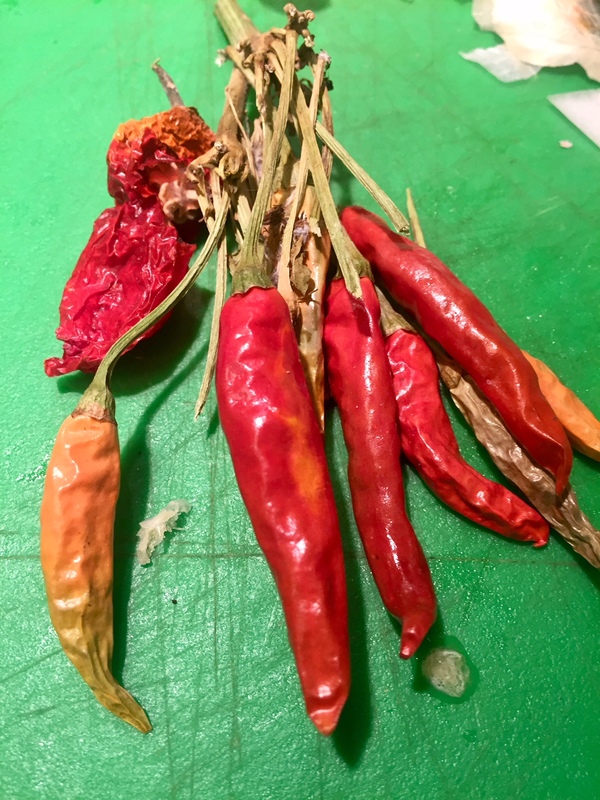 I used an incredibly hot pepper from a jalapeno pepper seller at my local farmers market. He warned me about it, so I used it cautiously and added only small amounts at a time. 5. When the eggplant and red pepper are finished, remove from the oven. Carefully slice the pepper into smaller pieces and remove its seeds. 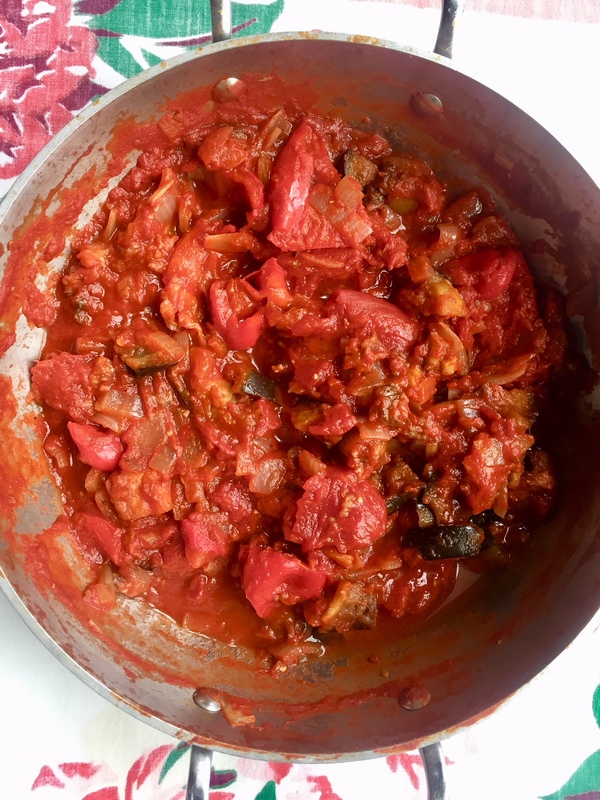 Add eggplant and chopped pepper to the tomato mixture and stir well. 6. Cook over low-medium heat for another 15 minutes. 7. Add salt and pepper to taste. If it’s not spicy enough, add more jalapeno, schug or harissa. Serve warm or at room temperature. 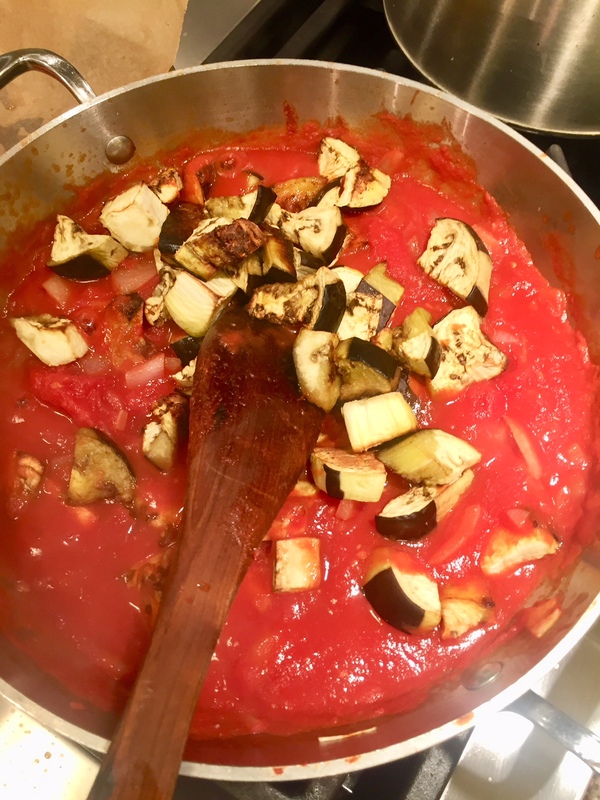 This entry was posted in Side dish, Travel, vegetable and tagged cooking, eggplant, food, Jewish, kosher, matbucha, Rome, Travel, vegan by Sarah Newman. Bookmark the permalink. What an evocative post. Made me hungry and eager to go back to Rome! Thanks. And yes, I agree-who doesn’t want to go to Rome?! This deliciouse recepy must be tasty not only in Rome. Look at the disc advertised after your recepy and you will be surprised . I love your writing, Sarah – really paints a picture. I’m going to try this recipe at home! Thanks so much, Chris. I really appreciate it and glad you enjoyed it. And I hope you enjoy the dish! Thanks so much, Buffy. Agreed-who doesn’t love Rome?! I know it was crazy, but I actually loved seeing the city by bike!